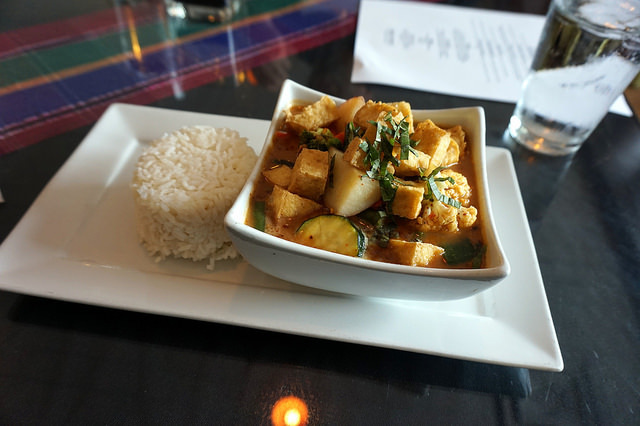 Roadtrip 2014 – Keo’s Kitchen in Saskatoon – vegan in your city. We went to Keo’s Kitchen twice during our stay in Saskatoon. First time was a bit of a let down, but the next was a huge improvement. I think service was essential towards a positive experience, and the other (for me) was spice. For reasons I don’t understand everything on menu at Keo’s Kitchen is not-spicy by default, as in, spice level zero. If you don’t specify spice, and your server doesn’t ask, then if you are me, you end up with an acceptable and tasty but not quite-what-you-wanted dish of food without heat. Then, again, if you are me, when you ask for more spice afterwards, and they charge you $2 for a small dish of chilli oil, you are even more annoyed. 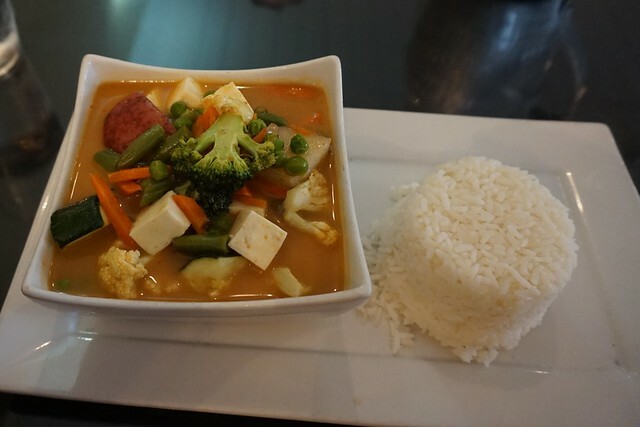 Both times, I ordered the massamun curry with tofu, which is my favourite dish to order no matter where I see it. Our server on the first visit didn’t ask us to specify anything about our order, so I also ended up with the soft tofu, which is fine, but this dish is just way better awesome with crispy tofu – I think in part because the sauce collects inside the tofu puff a lot more, and like broccoli sauce conveyances are important. So while coming back to Keo’s Kitchen wasn’t quite what I remembered, it was still so nice visit to an old favourite restaurant. I wasn’t able to go there that often when I was in school, but whenever I did it was always special, and it was nice to share that experience with JC regardless, and I’d recommend it to anyone looking for a nice dinner or lunch out, with hearty comforting options for everyone.